Amanda and Hugo Gervais are in their 3rd season of raising Rhode Island Reds, Barred Rocks, and White Leghorn laying hens. Given the frightful scenes of films like Food, Inc. where chickens are packed cage upon cage in confined lots, I always find hope and beauty in Vermont’s livestock farms with their quirky chicken tractors and lush pastures. Amanda and Hugo’s birds not only get to live in this fanciful coop but spend their time grubbing around for weeds, bugs, and their favorite: earth worms. 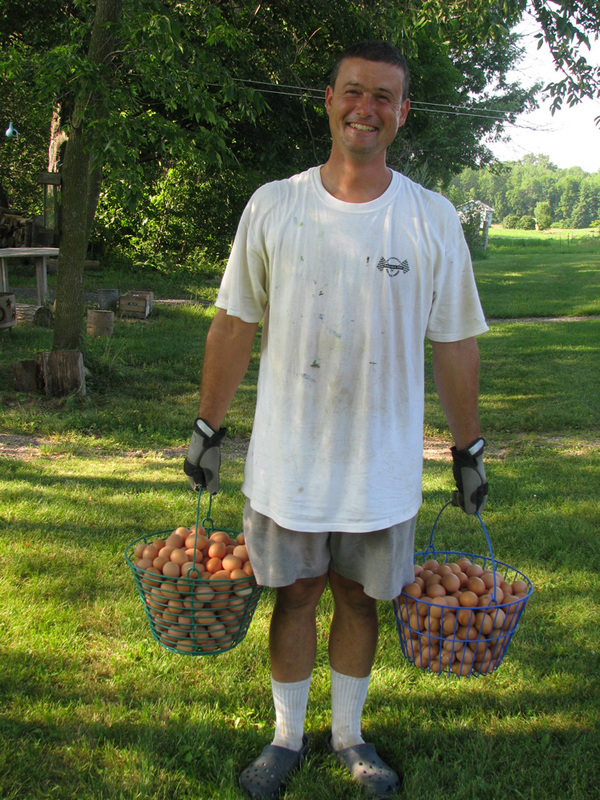 Savage Gardens produce 65-70 dozen eggs a day from about 900 birds. Hugo spends about 2 hours a day washing all those eggs by hand! In addition to all those eggs, Amanda and Hugo nurture vegetables, cut flowers, raspberries, and 2 small children. I finally got up the nerve to ask Amanda the story of their (ahem) irreverent logo. Amanda’s face immediately lit up and took me into the house to view the art work of Jerome Couëlle, her favorite artist. Amanda was first introduced to Couëlle’s art when she was in high school – someone sent her a postcard with the image of the chicken and the egg and she had kept it for years and years, not knowing anything about the artist. As she and Hugo were starting Savage Gardens, she wrote Couëlle a letter at his home in Toronto to ask if they could use the image as their logo. Little did she know she already knew Couëlle, personally, as he had been visiting her farm stand regularly for months from his summer home on North Hero! Their connection and friendship was born and Amanda’s daughter now attends the art classes Couëlle hosts at the public library in North Hero. I was captivated by Couëlle’s magical art. You can check out more of his images here.